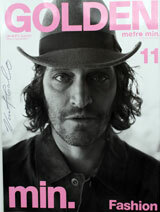 This Japanese magazine features Vincent Gallo on the cover, with a nine page spread featuring beautiful black and white photographs of Gallo. Text is in Japanese only. Cover is autographed by Vincent Gallo.